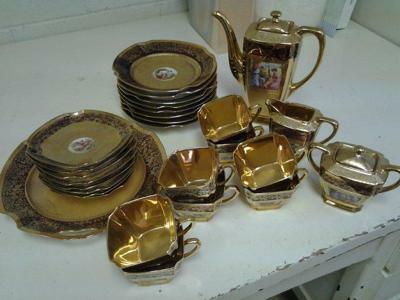 This Arzberg Bavaria 22 carat gold porcelain tea set was dropped off at our church thrift store and we have no idea what it is worth. I want to get this in the hands of an owner that will treasure it and at a price that benefits our charities. It is a complete set and I found it referred to as a luncheon set or tea set but can’t find any specifics about this set online. 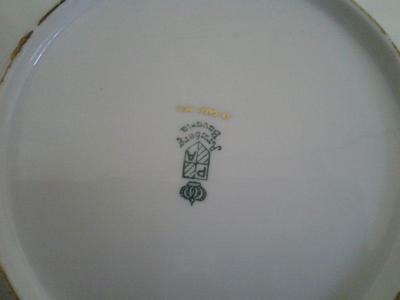 The Arzberg Bavaria makers mark indicates it was made between 1928 and 1946. It consists of 8 cups & saucers, 8 small plates, a serving plate, tea pot, creamer and sugar bowl. The painted scene in the center differs. A couple of the saucers and cups have matching scenes but others are unique. In all I believe there are 11 different scenes represented. This had to be a part of a porcelain collection of some sort. The scenes are pastoral and some appear Roman to me, but I’m not an expert. I hope someone sees this lovely Arzberg Bavaria 22 carat gold porcelain tea set and can tell us more about it or what it is worth.